With the Doomsday Arcade Series Finale going live this Thursday at noon EST, we thought the fans would enjoy some extra content from its creators throughout this week. As if the Series Finale of Doomsday Arcade wasn't awesome enough, Michael Shanks and Michael Lunds have given us more stuff to laugh at and keep us busy until this Thursday at noon rolls around. You can start by checking out the awesome Q&A with Doomsday mastermind, Shanks, that is now live! Is that not enough DA? Do you wish there was more? Your apocalyptic wish is granted! Tuesday, March 30th - NOW LIVE Doomsday Arcade Video - You do not want to miss the outtakes and behind the scenes from the finale episode. Wednesday, March 31st - NOW LIVE Doomsday Arcade Quiz - how much do you know about DA? Who will get the best score in the shortest amount of time? 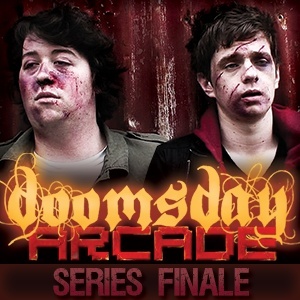 Thursday, April 1st - NOW LIVE Doomsday Arcade Series Finale - Do our heroes save the world or does the world of games bring everything down around them? Will there be massive explosions, bullets flying everywhere and the return of the cat? Answers to all these and more during the Series Finale of Doomsday Arcade! To watch all of the past Doomsday Arcade episodes to catch up for the Finale and get yourself a badge, visit our Doomsday Arcade video library and start the viewing bonanza!